We’d love your help. 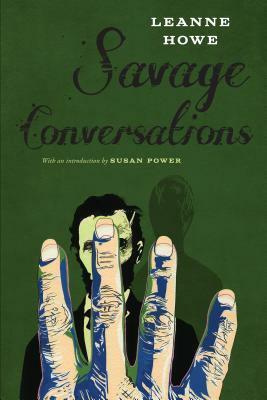 Let us know what’s wrong with this preview of Savage Conversations by LeAnne Howe. To ask other readers questions about Savage Conversations, please sign up. Will Jerrie, nice review, this sounds intriguing. Jerrie (redwritinghood) Will wrote: "Jerrie, nice review, this sounds intriguing." Thanks Will. This is really unique. Well worth reading. A fever dream fascinatingly both raw and lyrical, this exercise in dramatic frame interrogates historical perspective in a manner designed to disconcert, even to horrify. There is terrible beauty in the way nostalgic exceptionalism is toppled to make way for indignation and scorn, and the reader is left wondering not only what s/he just read, but what to do with it. I like to think of myself as a person who has read a lot about Mrs. Lincoln. I also think I am relatively intelligent and can reason through factual material that is presented to show many aspects of a topic. I respect strong women, from any historical period, who lived in time periods I only know about through reading. I also grew up in a household that respected Native Americans and honored their beliefs. Howe has a lot of hate that is expressed in this small book, on almost every page. There a I like to think of myself as a person who has read a lot about Mrs. Lincoln. I also think I am relatively intelligent and can reason through factual material that is presented to show many aspects of a topic. I respect strong women, from any historical period, who lived in time periods I only know about through reading. I also grew up in a household that respected Native Americans and honored their beliefs. Howe has a lot of hate that is expressed in this small book, on almost every page. There are also some conclusions drawn that have no factual basis. In point: Mrs. Lincoln suffered from migraines. In an effort to describe her pain, she often referred to her skull feeling as if a tomahawk was piercing it. She sometimes referred to her migraines as "Chief Tomahawk has come calling." In an effort to describe her pain, she used a reference from her historical point of time. Migraineurs often name their headaches in an effort to have a specific "thing" to fight against. The author makes a big leap in stating that Mrs. Lincoln is referring to a Native American spirit who is not only a Dakota, but also one of the 38 Dakota men hung in a hideous execution approved by President Lincoln in 1862 after the Dakota Uprising. This is fiction--not fact. This is why I read books by Coffee House Press. They are constantly bringing attention to authors who are willing to explore form, language, and break the rules of what a book is supposed to be and do. LeAnne Howe relies on the playwriting format to tell us about Mary Todd Lincoln who was committed in a psychiatric hospital a few years after her husband's assassination. Mary claimed to see and talk and be hurt by a "savage Dakota man" so, Howe offers us a glimpse into these conversations with th This is why I read books by Coffee House Press. They are constantly bringing attention to authors who are willing to explore form, language, and break the rules of what a book is supposed to be and do. LeAnne Howe relies on the playwriting format to tell us about Mary Todd Lincoln who was committed in a psychiatric hospital a few years after her husband's assassination. Mary claimed to see and talk and be hurt by a "savage Dakota man" so, Howe offers us a glimpse into these conversations with the intervention of a third voice that brings another layer to understanding violence. A difficult, beautiful work of dramatic poetry. Howe's words have given me much food for thought. Savage Conversations is structured as a dialogue between Mary Todd Lincoln, the ghost of a Dakota Indian (identified as "Savage Indian"), and the rope with which that Indian was hanged. The Indian is one of the 38 Dakota men ordered hanged in Mankato, MN for their part in a raid against white settlers during the Dakota Wars of 1862. This mass execution, the largest in American history, was ordered by President Abraham Lincoln. While researching Lincoln, LeAnne Howe learned that in the 1870s, as Savage Conversations is structured as a dialogue between Mary Todd Lincoln, the ghost of a Dakota Indian (identified as "Savage Indian"), and the rope with which that Indian was hanged. The Indian is one of the 38 Dakota men ordered hanged in Mankato, MN for their part in a raid against white settlers during the Dakota Wars of 1862. This mass execution, the largest in American history, was ordered by President Abraham Lincoln. While researching Lincoln, LeAnne Howe learned that in the 1870s, as Mary Todd Lincoln struggled with mental illness, she reported that a "savage Indian" would come to her room in the night, scalp her, and cut her face: "'The Indian,' she says, 'slits my eyelids and sews them open, always removing the wires by dawn's first light.'" Howe's short play imagines that this spirit who visits and torments Ms. Lincoln in the night is the ghost of one of the Dakota executed by her husband. I really, REALLY want to see this performed. I liked the idea, but I did not like the execution of the idea. I don't feel like it treated the subject with enough gravity. I’d love to see a live performance of this someday.